The first-person dungeon crawler is rarely done right, even by RPG experts. 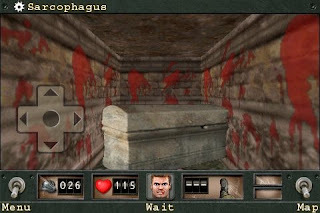 The genre is filled with dark, boring, soulless games that leave you drooling all over yourself. The problem is many developers fail to understand that the genre is just as much about the first person gameplay as it is about the RPG elements. Wolfenstein RPG for iOS does though, and the result is one of the only truly memorable experiences ever released for a mobile device. Reminiscent of the original Id Software games such as Wolfenstein 3D and Doom, Wolfenstein RPG is a familiar game for a modern platform. Graphically, the game perfectly captures the look of classic FPS games. This goes for the shooting as well. The pacing is what is very different. To fit the genre, combat is now turn based. This is not to say the combat is slow though, as turns go by very fast and you often fight several enemies at once. Everything is pretty straight forward, either moving one space, attacking, or using an item will act as a single turn. While the combat has no heavy emphasis on strategy, you will die if you blindly run in to a fight. There is also plenty of loot scattered throughout the many lengthy levels of the game, some of which you really need to do some searching for. You can also collect rare items hidden throughout the level and upon completing a level the game will tally the items you have collected as well as other statistics such as how many enemy flags you destroyed. After moving on to the next level you can not back-track to previous levels, but there is so much to do in each level it does not matter. 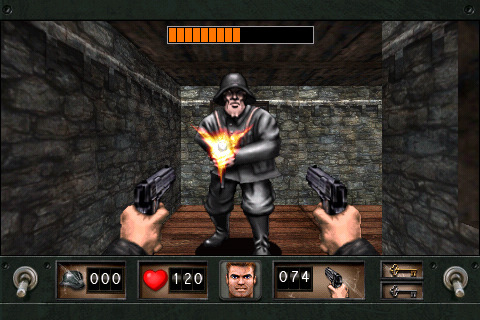 Hours of dungeon crawling can become tedious though and Wolfenstein RPG tries to correct that. Unfortunately the game throws in random on-rails shooting moments featuring your player manning a turret on a moving truck. The entire game is on a grid, so you in the regular portions of the game you can only turn 90 degrees at a time. This same philosophy is carried over to the on rails shooter segments, as there are only three different positions in which you can angle the machine gun. Meanwhile the screen is moving up and down as the truck goes traverses hilly terrain. The combination of these elements makes aiming extremely difficult during these segments and the short time you must endure this is nauseating. Worst of all, there is no warning given for when these will occur meaning you are not given time to heal. You kill an enemy, open a door and, surprise, now you have to mount a turret. If your health is low, too bad. Death forces you to load your previous save. Luckily these moments are brief and rarely occur. Still, the game's charm is undeniable. Kicking chickens to their death and destroying Hitler portraits has never been so much fun. There is even a hidden chicken kicking mini-game on one level. You can save at any time which makes the game very mobile despite its depth. Leveling up exists but is rare and actually makes you work for raising your stats. Ammo is also scarce, forcing you to sometimes rely on your bare fists, but health packs can be found at every turn. The touch interface works extraordinarily well as you can switch guns with a tap of a button or hold your finger down to open up a menu of all your guns. The buttons are nice and big so you will not mis-click and text is big in the menus. 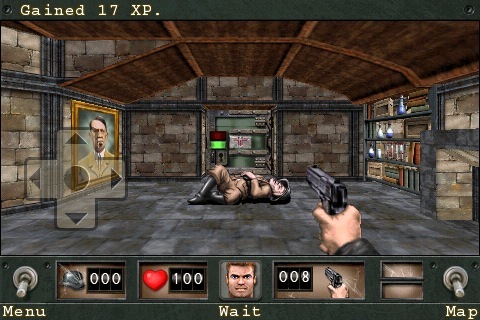 Wolfenstein RPG is clearly optimized for mobile devices and works very well. 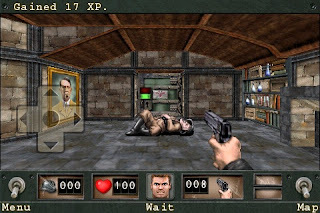 Wolfenstein RPG is deserving of its name. It takes many things we love from Wolfenstein 3D and combines them with many things we love from the standard first-person dungeon crawler. The shooting is not overly complex and the RPG elements are not overly complex either, but for a mobile game that is exactly what you want. This is an easy game to pick up and play and saving at any time means you never have to be too afraid of dying. The look and feel is that of classic FPS games, so retro and modern fans alike will love this ten hour adventure.